I don’t often go out to Sandymount but on a friend’s request to play photographer for an hour or so for shots to be used on his website – honestly, I was nervous and didn’t know if I’d do a decent job of it – I took a leisurely stroll over from Ballsbridge. And on the way, I passed by a deserted Sandymount DART station. 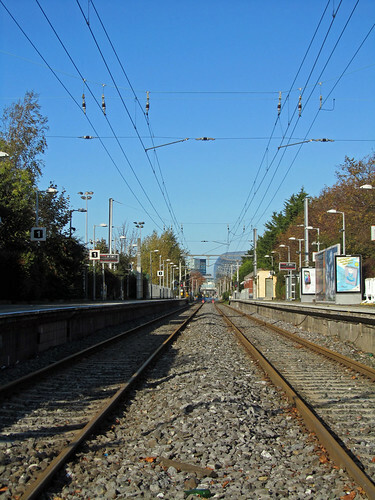 It was rather odd and seeing there weren’t any train coming, I stood smack in the middle of the track and snapped a couple of quick pictures for today (spot the glassy Aviva stadium in the background). Only later, when I spoke to my friends that I got to know that the rail service at that stretch is down. Part of the track collapsed after the massive flood last week and it’s still in reparation process.